Your meat will arrive frozen or refrigerated. Since we freeze our meat immediately, it is much fresher than most frozen meat you find in a store. The professional chefs who shop with us prefer our frozen meat to anything else available fresh. Is Grow and Behold meat "organic"? It's better than organic! Certification doesn't always mean everything you want it to mean; for example, USDA organic standards allow chickens to be raised in near total confinement and fed nothing but organic corn and still be called "free-range organic." Those practices are unacceptable to us; we want the animals to be outside and enjoy life in their natural setting. Our animals are all raised outdoors on pasture, with plenty of room to move around, forage and otherwise express their natural tendencies. Do I need to cook pastured meat any differently? In general, you can follow your favorite recipes for all our products. For our dark meat chicken, we recommend cooking at a lower temperature and with a little more liquid, for a longer time. (Since the birds actually move around, the leg fibers benefit from slightly longer cooking time to soften up.) Otherwise, since our pastured meats have so much flavor, you may find yourself grilling a steak or roasting a chicken with nothing but salt, pepper and olive oil so you can really enjoy the taste of the meat itself -- no complicated sauces needed. Why are your cattle fed grain before slaughter? Including some grain in our cattle's diet helps us deliver a more affordable, tender, delicious and consistent product. The animals NEVER receive growth hormones or routine doses of preventative antibiotics. Our finishing yards are clean, spacious and animals are healthy and well-cared for. Their 100% vegetarian diet (no animal by-products) consists of a balance of hay, grass and grain. Although it's the topic of much press and conversation, feeding grain to cattle is not always a bad thing. Feeding cattle only grain makes them sick, which is the practice on large feedlots. We abhor the practices of these large feedlots, where overcrowded, malnourished cattle are routinely fed antibiotics to help them put on weight for slaughter as quickly as possible. However, cattle naturally eat grain in their diets (grass seeds are grains), and people have been feeding animals limited amounts of grain for milennia to produce flavorful, well-marbled meat (see Harold McGee, On Food and Cooking, p. 135). In contrast to feedlot beef, our animals are healthy as evidenced by our extremely high kosher rates and extremely low incidence of illness. Grain is gradually introduced into their diet in the last few months, and is never more than 50% of their diet (the remainder of their diet is grass and hay.) We inspect our farms regularly to ensure that conditions meet our standards. We examine every animal before slaughter, and again after slaughter (checking innards) and attest that our animals are healthy and do not suffer from the grain (in fact, they eat it eagerly!). While the arguments for and against GMOs are complex, we do encourage our farmers to use GMO-free feed where possible. All our poultry receive GMO-free, locally-milled feed. Lamb receive a very limited amount of conventional feed (only while in transit). Beef feed is conventional. Note that in all cases grain feed is a supplement to the diet of pasture grasses available to the animals at all times. When we assure you that our meat is produced according to the strictest standards of kashrut, animal welfare, worker treatment, and sustainable agriculture, we do mean just that: we are taking many aspects of meat productions into consideration to produce the best kosher meat on the market. We have spent considerable time and effort exploring the field (including working on small farms, in butcher shops, and slaughterhouses across the country), and we haven't yet been able to find beef produced with GMO-free grain that also meets our other standards, including feed being grown nearby, being able to slaughter the animals upright and in facilities near to where they are raised, supporting small farms and production facilities with good working conditions, (including healthcare for the line-workers), while producing high quality delicious meat under rigorous kashrut supervision. These aspects are all critical to us in piecing together the puzzle of kosher sustainable agriculture today. If avoiding GMOs is of critical importance to you, we hope you'll check out our pastured poultry. Do you sell prepared foods? Most of what we sell is raw frozen meat. However, some of our items are ready to enjoy with a little heating up: broths, deli meats, sausages and hotdogs and our BBQ Short Ribs. We do not sell prepared meals. Do you sell eggs or bison? While we do hope to carry bison eventually, we have yet to find farms that meet our rigorous standards. It is not practical for us to ship or deliver eggs at this time, but we suggest that you talk to a vendor at your local farmer's market or search on Local Harvest for a nearby source. Are all meats kosher for Passover? All of our raw Beef, Veal, Lamb and Poultry are kosher for Passover year-round with no additional markings on the package. Additional kashrut information can be found here. My vacuum package arrived with a small puncture. Is the meat still good? Sometimes sharp bones or rough handling by FedEx will cause punctures in the packaging. Additionally, dry ice can make the plastic extra brittle and prone to breakage in transport. However, your meat is still completely safe to eat; we recommend defrosting it over a plate or bowl to avoid leakage. Please see our Delivery & Shipping page for more information. You can call us or email us to make changes to your order; if we have not already begun preparing your order for delivery, we will do our best to accommodate your requests. You will not be able to change your order by logging in to your account. What does ~ mean for weights? Why do you sell meats in a weight range? To keep our fulfillment system practical and manageable, products with variable weights are sold in a weight range (this includes most frozen meats, with the exception of deli meats, sausages and beef jerky). If the weight you are selecting represents a range, it will be shown with "~" in front of it. We keep the ranges as small as practically possible to minimize the variation you might receive. Sometimes you will receive a bit more than the listed weight, and sometimes a bit less. Our customers find that on average they receive what they are expecting. But if you find that your actual weights in an order are all below the listed average, please snap a picture of the weight labels and send it over to us, and we'll be happy to make things right. We strive to keep consistent sizes within packages, but meat is a natural product and there may be some variation. To determine the individual weight of each piece, divide the Total Weight by Total Pieces, which you'll see displayed just above the "Add to Order" button. 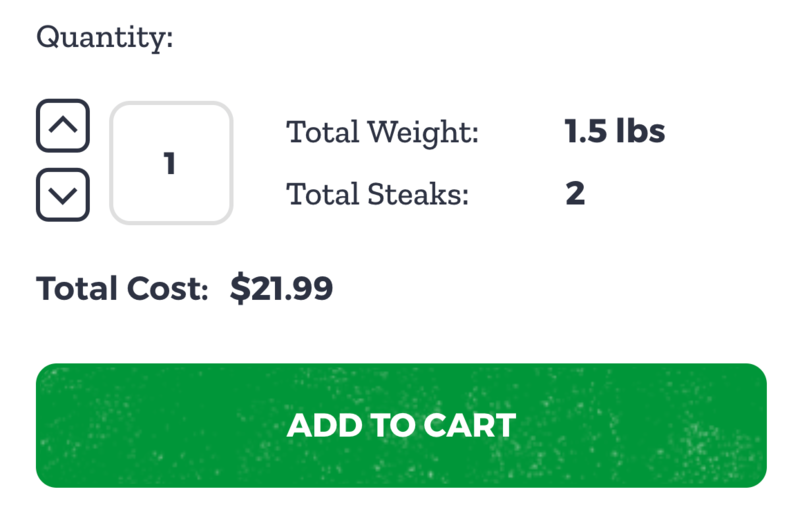 In this example, a 1.5lb box of Denver Steaks contains 2 steaks. Each steak would weigh approximately 0.75lbs or 12oz. Can I get credit when I refer my friends? Yes! We love it when our customers tell their friends. We offer a 15% coupon off a first order, and a $25 store credit once your friend places their order. Click on the orange "Refer a Friend & Earn $25" button at the bottom right of your screen and follow the instructions. You must have an account; your friend must have not ordered from us before to be eligible for the discounts and rewards. Thank you in advance for spreading the word! Will you support our community auction/ad book? Please contact us with details of your event. While we generally do not place paid ads in program journals, we can generally offer a gift certificate for an auction. Due to the high demand of requests, however, we may not be able to accomodate all requests. Please email us at info@growandbehold.com for more information.